Good morning friends and happy Friday. I’m so giddy my guest arrives today! It’s a big deal for me because it’s my sister and it’s been five years since I’ve seen her, five years since she was last here. Awww, it’s just making my heart sing!! I hope to post the other turndown gifts this weekend, time permitting, in the meantime I have a new card to share today and it is the card that you can win for Day of Giving Friday! If you are new to my blog – you can find info about Day of Giving on my FAQ List at #11. I’m using a Quietfire Design sentiment called Always Be My Friend and framed it using Spellbinders Pierced Rectangles. On each corner of the frame I glued accent pieces from Spellbinders Imperial Square. To add some extra interest I worked in Spellbinders Victorian Arch and used the lovely edge as a border. And finally to get some color at the top of my design I used Spellbinders Gilded Gate Two and just cut the upper curve – it’s tucked in at the top of my frame. For today’s comment – What’s making your heart sing today? Oh my gosh, your card is so beautiful!! I have it in my heart that I will win this one!! I hope your visit with your sister is blessed with joy and much fun. thank you so much for sharing and the chance to win. Such a beautiful card for give away Friday.Love that little floral paper, Becca. Enjoy your time with your Sis. And yes, Becca, I will always be your friend. Another amazing card here Sweet lady. Sooo beautiful and perfect in any way. Feeling a bit under the weather today Becca but i have my youngest son calling in tonight so that will cheer me no end. Have a lovely time with your Sister . Becca just love your card and the thing that makes my heart sing today is a beautiful day crafting with a good friend. I love this card! I love that it could be easily done with what dies you have and is simple, but elegant, enough for even the novice card maker. Not too much singing today–sore throat and heavy chest. But, hopefully well enough for Mexican for lunch with hubby today. And of course, so glad it’s Friday. What a beautiful card so simple and clean, never think of stamping on the pattern paper.Nothing special today to make my heart sing.Have a wonderful visit with your sister. 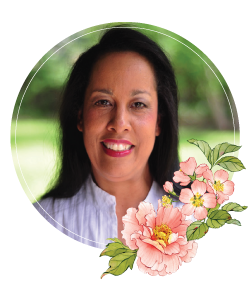 My heart is singing because the weather is beautiful – cooler but sunny; my health has improved over the last couple weeks; and I’m just happy to be alive and able to do what I want when I want. The card is beautiful. Love the framing. Ah – another beautiful card with such well thought-out details! Hi Becca another beautiful card and sentiment. Have a fantastic time with your sister they are very precious gifts. I wish I could see mine more often but it is now several years since we have managed to see one another due to illness, but she would love this card, as would I if she sent it to me. It seems like each card you make gets more beautiful. I love this one. Stunning!!!!! Hope you and your sister have a grand visit and enjoy your girls night out!!!!!! This will be a wonderful weekend for Hubby and I. Some of my son’s old high school buddies (my other kids as they spent so much time with us while we were living up north), are coming to town and we all plan to get together and reminisce. Haven’t seen them for twenty years now, since we transferred to San Diego. Really looking forward to our reunion and meeting all of their significant others. 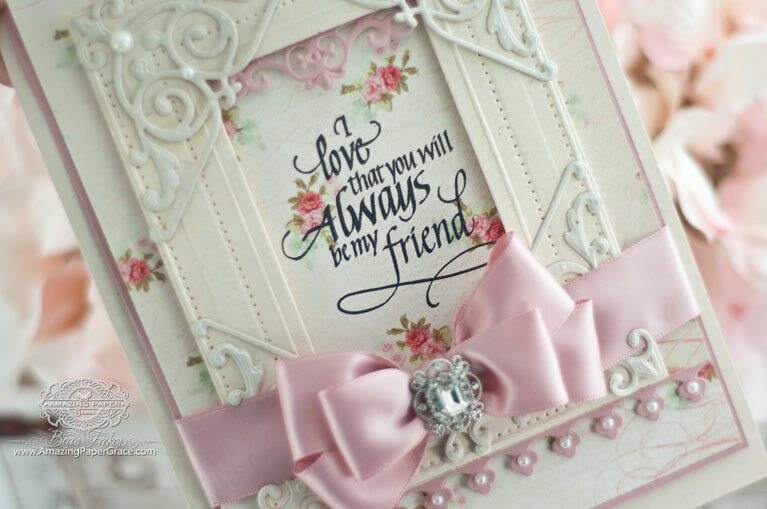 Oh, so many things I love about this card- the sentiment, obviously, the pretty flowered background, the stitching on the frame, the pink elaborate bow, the bits of pearl bling, to name a few. I have not seen my daughter for over 8 years, she lives in Australia and has a daughter just 7 years old, that I’ve not seen either ! I love todays card ! Have a lovely time with your sister Becca! comments about your beautiful cards. As always this is beyond beautiful. Have fun with your sister. Such a pretty card, Becca. I hope you and your sis have a lovely visit. Five years is too long! This morning it is the simple things that make my heart sing….a kitty sleeping on my lap, a cool, cloudy fall morning, some more tomatoes to bring in off the vine, and some time in the Mom Cave creating. What could be better? seen them since they were born. Absolutely gorgeous card today, Becca! It could not be sweeter!! I’m so happy you are having a visit with your sister. What a blessing!!! I hope every moment is precious and enjoyed to the full. My heart is singing today because we serve a risen Savior who lives in our hearts. We can KNOW God personally. Amazing. Wonderful. Better stop before I get preachy. Oh Becca, this card is stunningly gorgeous!! 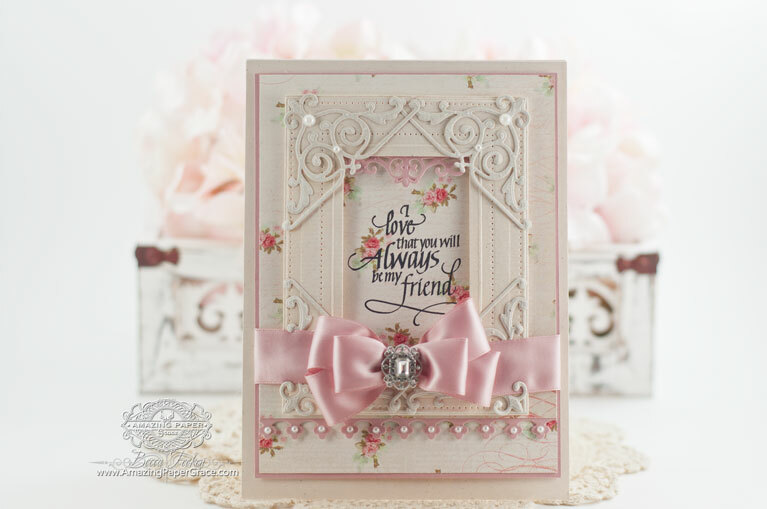 The layering of all this incredible dies is impeccable, what a glorious way to frame this beautiful sentiment!! All the details are just lovely. My heart sings every day, we have our daughters and grandchildren living so close by, one next door and the other one just about 20 min. away, that is good enough reason for my heart to be happy. But today in particular it sings because my little blog is going great, I’ve won a guest designer spot at Merry Monday and all the comments left on all my posts are so sweet and supportive. I love the world wide community of crafters united by the love of paper, ink and stamps. Thank you for the chance to win this amazing card. Good morning Becca, what makes my heart sing? You do with your beautiful cards!!! that’s making my heart sing!!! Have a fabulous time with your sister!!! So happy for you Becca….enjoy the visit!!! I am preparing for a train trip – first class – with my husband in a few days and we are both looking forward to it…to visit his sister – how sweet it will be! Thanks for the chance to win your GORGEOUS card! Hi Becca, I hope everything is going well with your Sister visiting you, how excited you must be, and she will be equally as excited. This card is really pretty, the paper is really beautiful and the die-cuts and bow etc are very very pretty. I love this !! What is making my heart sing today is – I have finally finished decorating my lounge, and this morning I put up my new curtains and placed my new cushions and throws on the couch and chairs (I have only had all these things for 4 years and not had the time to do it), I stood back and looked at everything that had ‘come together’ and I felt so happy. Now I’m onto the next room hahaha. I am so happy for you to be with your sister. My twin sister lives too far away and we just don’t see each other enough. The times together just get more precious with each passing year. My heart seems to be humming more than singing today-too much sadness, lately. Even though there is no chill in the air, nature is broadcasting “Fall is here!”-my favorite time of the year. It’s Friday, it’s Fall and God blesses me so abundantly. Now there’s something to sing about. Amen! your design, but so elegant! Thx for sharing! Hello Becca – This weeks card is a real favorite of mine. I love the pink! It’s my favorite color and the die cut accents add just the right touch. I particularly love the frame you created for the sentiment! My heart is singing today and has been for six weeks because I am visiting with my daughter and her family. I got to see my new grandson grow from two weeks to eight weeks and my three year old is my bedtime buddy. The joy of hearing,” grandma, I don’t want you to leave, ever, ” fills my heart and breaks it at the same time. And who can resist a newborn sleeping on their chest? I do hope that you will one day have your heart filled with grandchildren. All my sisters are out of state also, as is this daughter, so I can relate to the gladness that you feel when seeing your sister. Have FUN! This card is just so lovely in all it’s wonderful design and sentiment that it really touched my heart after the very rough time I have been having lately. I long to hear someone say that to me in RL. I was just diagnosed with Psoriatic Arthritis and Enthesitis which at this time is not being managed as I am allergic to most of the medicines used to control it. Or the one I could take my health insurance refuses to cover. So right now I would love for someone, anyone to make me a lovely card to help give me Hope to keep taking that One More Step Forward even as much as it physically hurts me. You can also find me on Twitter as ffpaws and on Pinterest as ffpaws. I am not trying to be a Beggar, just honestly appreciating this community and striving to be a part of it as I can, but it is really hard to make cards with my hands so severely affected by the PsA, Tendinitis and Carpal Tunnel. Such a magnificent card Becca. I love your unusual combination of dies (I don’t have any of them ‘sniff’). Thank you for the chance to win this beauty. Today I feel like a teenager again because it has been confirmed that my dear husband does not have ‘that’ dreaded disease and will be right as rain again in jig time. Thank you Lord! Have the time of your life with your sister and let everything else go to pot, you’ll catch up on mundane things later! I think I’d like to be a fly on your wall. Ha ha. What a beautiful card with a gorgeous sentiment. My heart is singing today because I received an e-mail from someone with whom I’ve been exchanging ATC’s for the last 5 years. She’s coming up to my City next weekend and would like to visit me. It will be the first time we have met in person. How exciting. I LOVE this card, especially the sentiment! You always have “something” new that I will “take away” to incorporate in my cards. Today is no exception. Beautiful card. Today I was with two old friends I used to work with. Being with old friends, no matter how long it has been since you have seen each other, and catching up with their lives always makes my heart sing. I hope you and your sister have a wonderful time. Treasure each other! I miss my sisters. Gorgeous, gorgeous card, so pretty. Have a fabulous weekend with your sister the time will go all too quickly. Whats making my heart sing? I am meeting a new male friend tomorrow, just like a blind date, but found on a singles site – Will he be the one for me? I hope so. Love your card very pretty ! Oh Becca! What a beautiful card – and what a beautiful day for you! I hope you and your sister have a wonderful time together!